Also, happy birthday to my brother! Send him your well wishes, mostly because he probably has zero clue who Cthulhu is. Actually, I recant my birthday greeting. That is lovely and stirred up very pleasant memories. 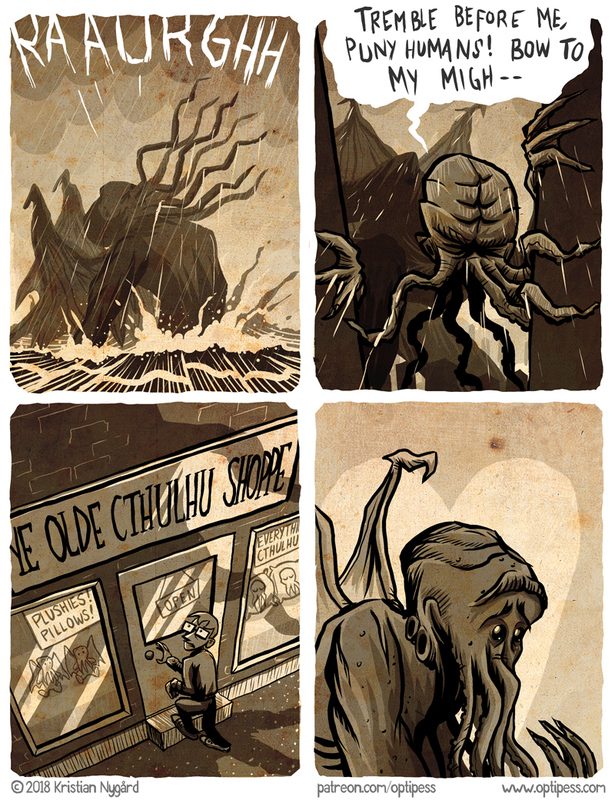 I used to read Lovecraft to my daughter at bed time from the time she was 4. She still loves his stories and was never frightened by them. A librarian once threatened me with arrest for child abuse when we approached her to ask for his work. She was about 6 and asked the librarian if she had trouble distinguishing between fiction and reality. The librarian was horrified and stormed away without helping us or causing my arrest. There are stores that sell such items. “Child abuse” for reading her a classic novel?! To put it bluntly, I don’t think that librarian had a very diverse literary repertoire. Haha wow, that is amazing. How old is your daughter now? Does ANYTHING scare her at all? Hmm, maybe Lovecraft should be required reading for all toddlers to prepare them for the horrors of the real world. Also, thanks so much for your donation, Mark! I’m glad the anecdote was well received. She will be 36 soon. There are things that frighten her, but they are all real & earthly possibilities. You are most welcome for the donation. Ahh, I’m still kicking myself for not going to Providence when I visited New England a couple years ago. My buddies and I went to Salem instead, which was pretty cool of course, but I’m sure we’d find much more to geek out over in Providence. That feels familiar. I guess you know about the musical anyway.